The last two years presented the MLab with many exciting opportunities to further our ongoing research in physical computing, fabrication, experimental exhibits, and media history. We continued work on the Kits for Cultural History, and we opened the Digital Fabrication Lab (DFL) in collaboration with Visual Arts. We also appeared in 13 peer-reviewed publications and news outlets, hosted 11 visiting speakers and workshops, gave ~35 talks, attended various conferences throughout North America and Europe, and continued our engagement with communities of scholars across media studies, fine arts, disability studies, design studies, libraries, digital humanities, architecture, cultural studies, anthropology, and science and technology studies. Below is an extensive summary of everything the MLab has been up to since October 2014, including links to additional reading. Thanks to everyone who has supported us along the way! We really appreciate it, and we’re looking forward to 2017. MLab at Michigan: Jentery visited the University of Michigan for a one-day conference titled, “Data, Social Justice, and the Humanities,” to deliver a talk, “‘The Data Knows You Better Than You Do’ and Other Constructions.” The presentation focused on the Internet of Things (IoT) and its entanglements with social justice and computational culture. During the talk, Jentery mentioned a number of related projects that also engage social justice and the IoT. These projects include Digital Labor: The Internet as Playground and Factory, Wyld Collective, Local Autonomy Networks (Autonets), “Circuit Bending Videogames” (by the MLab’s Nina Belojevic), Seattle Attic, Double Union, Free Geek, and Machine Project. MLab + #remixthediss: We joined HASTAC and The Futures Initiative at CUNY for “What Is a Dissertation? New Models, New Methods, New Media.” In the lab, we had people from various parts of UVic discuss their perspectives on models for the doctoral dissertation, and we considered how those models might be enacted. MLab on the Cover of Nexus: The MLab was featured in a news story profiling local makerspaces to highlight the growing popularity of DIY cultures in Greater Victoria. The cover story was published in issue 25.4 of Camosun College’s student newspaper, Nexus. In the article, Nina and Jentery offer their perspective on DIY movements and how the MLab offers a unique space for cross-disciplinary collaboration at UVic. MLab at “Seeing the Past”: Jentery visited Niagara-on-the-Lake for a conference organized by Kevin Kee, Karen Flindall, and Bill Turkel, titled “Seeing the Past: Augmented Reality and Computer Vision.” At the event, Jentery circulated a draft of his essay, “Bringing Trouvé to Light: Using Computer Vision to Speculate about Victorian Media,” for an edited collection of publications from the conference. MLab at UVA: Jentery visited the University of Virginia to give a talk, “Remaking Victorian Miniatures: Speculative Stitches Between 2D and 3D,” in which he discussed the MLab’s Kits for Cultural History project and, more specifically, remaking old technologies in the context of Victorian media studies. His presentation took place at the Scholars’ Lab (in Alderman Library), a humanities lab that’s inspired the MLab. Praxis Award: With the Electronic Textual Cultures Lab, the MLab announced the winners of the 2014-15 Digital Humanities Praxis Innovation Award at the University of Victoria (UVic): Elizabeth Bassett (MA, English) and Nadia Timperio (MA, English). MLab WECS Talk: Nina and Jentery gave a talk for the Women in Engineering and Computer Science (WECS) speaker series at UVic about their experiences working at the MLab. MLab at MLA 2015: Several members of the MLab team presented at the 2015 Modern Language Association convention in Vancouver. Nina and Shaun contributed to “Critical DH: Interventions in Scholarly Communications and Publishing,” and Jentery presented on the topic of “Transduction Literacies” for the “Making Writing” panel. He also gave a talk titled, “Warped Modernisms,” for the “Making as Method” panel on critical making, literature, and culture. Both of these talks corresponded with the MLab’s research on the intersections of making (broadly understood) with writing and composition. CFP for Making Humanities Matter: Informed by the MLab’s research, Jentery issued a call for papers for a new volume of Debates in the Digital Humanities (Matthew K. Gold and Lauren F. Klein, eds.) titled, Making Humanities Matter, with the University of Minnesota Press. In 2016, the manuscript for the edited collection was completed and submitted to the press for publication. Structured-Light 3D Scanner Arrives: After the arrival of some new research equipment over the holidays, the MLab started experimenting with an HDI 120 3D Scanner. The scanner, which can digitize objects up to 60 microns in resolution using blue-LED, structured-light technology, has since been put to the task of digitizing wooden models for the MLab’s Early Wearables Kit as well as other materials for various scholarly projects, including MLab collaborations with several memory institutions in Canada. Dene Grigar at the MLab: Dene Grigar (Creative Media and Digital Culture, Washington State University, Vancouver) dropped by the MLab to talk with us about histories of making in the humanities as well as the practice of preserving electronic literature and new media. UVic Hosts Lisa Nakamura: The Digital Humanities Committee at UVic had the pleasure of hosting a public Lansdowne lecture by Lisa Nakamura; it was titled, “Media Archaeology from the Margins: Race, Gender, and Indigenous Labor.” Also, as part of a collaboration between the MLab, the DH Committee, and the Pacific Centre for Technology and Culture (PACTAC), Nakamura conducted a public PACTAC seminar on “The Digital Afterlife of This Bridge Called My Back: Woman of Color Theory and Activism on Social Media.” She also took time to talk with each MLab researcher about their research interests, inspiring us to pursue exciting new directions in media and cultural studies. MLab Collaborates with CFUV Women’s Collective: In collaboration with the CFUV Radio Women’s Collective, Nina and Shaun conducted an Arduino workshop titled, “Making Media Art as Feminist Practice.” Participants learned to build simple circuits that sense environmental input and translate it into visual output. The workshop aimed to explore feminist media art and practices and their relationship to circuit design; participants also discussed technical practice in women’s histories of technology and computing. MLab Gets Milling: Among some of the new equipment received by the MLab, the SRM-20 desktop milling machine was a welcome addition. The machine employs subtractive manufacturing with a highly precise mechanical drilling resolution. It turned out to be the perfect tool for cutting jewelry pieces in the Early Wearables Kit. MLab at University of South Carolina: Jentery visited the University of South Carolina to give a talk on “The Digging Condition” (also the working title of his monograph in progress), in which he discussed various theories of materiality and ephemerality after the so-called “material turn” in media studies. Drawing from a sound studies perspective, his talk emphasized what we can learn from negotiations with materials over time. MLab in The Nonhuman Turn: Published in February 2015, Richard Grusin‘s edited collection, The Nonhuman Turn, included Rebekah Sheldon’s chapter, “Object-Oriented Ontology and Feminist New Materialism,” which treats the Kits for Cultural History as an alternative to distant reading. Thanks, Rebekah! MLab at IdeaFest: Along with five other speakers, MLab researchers participated in a panel titled, “Humanities in a Lab Coat,” during UVic’s IdeaFest event. The panel showcased the MLab as a collaborative humanities research lab, together with other initiatives and spaces on campus: The Humanities Computing and Media Centre, The Electronic Textual Cultures Lab, The Digital Language Learning Lab, The Speech Research Lab, and The Sociolinguistics Research Lab. MLab Hosts Garnet Hertz: Garnet Hertz visited from Emily Carr University to give a lecture on his studio work in electronic art and industrial design. The lecture was sponsored by the MLab in partnership with PACTAC. The MLab also had the privilege of playing with clay in Hertz’s prototyping workshop. Programming Workshop: As part of our “Hello World” series with the Digital Humanities Summer Institute, we offered a workshop on programming (in Python 3) for the arts and humanities. MLab Hosts Alexandrine Boudreault-Fournier: Sponsored by the MLab, Alexandrine Boudreault-Fournier from UVic’s Department of Anthropology gave a talk on campus discussing her research on alternative networks of music production and circulation in Cuba. MLab on “Critical Making”: For Roger Whitson‘s webinar lecture series, “Critical Making in Digital Humanities,” Jentery gave a talk titled, “Where Are the Politics?”, on combining critical making with social justice research. Other speakers in the series included Kari Kraus, Lori Emerson, Garnet Hertz, Amaranth Borsuk, and Matt Ratto. MLab at Minnesota’s School of Architecture: As part of the University of Minnesota’s “Architecture as Catalyst” workshop series, Jentery co-taught a week-long course with architect, Andrea Johnson. It was titled, “Reading Facades: Integrating Human and Computer Vision” (syllabus). While at Minnesota, Jentery also gave a talk in the School of Architecture and College of Design: “Human-Machine Vision: A Post-Cinematic Approach.” At the end of the week, architecture students in Johnson and Jentery’s course presented their work (a combination of models, renderings, prototypes, and vision scripts) during a public exhibition, resulting in some wonderful documentation compiled by Johnson. Fab Lab Opens Its Doors: In a collaboration between the Departments of English and Visual Arts, the new Digital Fabrication Lab (DFL) officially opened for use as a research facility. The DFL’s opening was a significant announcement; as a computer numerical control (CNC) lab with a base in the humanities, it is the first of its kind in North America. Since April, it has been gradually integrated into collaborative research on media history, material culture studies, sculpture, and experimental art conducted by both the MLab and Visual Arts. MLab at Waterloo: Drawing from critical theories informing the MLab’s various prototyping methods, Jentery gave the keynote at the University of Waterloo’s Experimental Digital Media (XDM) symposium, “Feedback, Fedback, Feedforward.” The event exhibited student projects exploring the intersections of art and information communication technologies. With faculty such as Beth Coleman, Aimée Morrison, and Marcel O’Gorman, Waterloo’s XDM program has deeply inspired the MLab’s research, and the “Feedback, Fedback, Feedforward” event was a highlight of 2015. MLab at Stanford: Jentery visited Stanford University’s Division of Literatures, Cultures, and Languages to give a talk titled, “Prototyping and Pedagogy in the Humanities,” where he discussed the role of prototyping in humanities teaching and research. During the talk, he connected the MLab’s methods and culture with changes in his own pedagogy. For instance, the MLab’s prototyping work heavily influenced the design of “What’s in a Game?” (a UVic digital humanities course about prototyping indie games). MLab at UCLA: Jentery visited the University of California, Los Angeles to attend “Inertia: A Conference on Sound, Media, and the Digital Humanities,” with keynotes delivered by Jonathan Sterne and Kiri Miller. In the Charles E. Young Research Library, Jentery took part in a panel titled, “Mapping Sound,” alongside Gaye Theresa Johnson, Peter McMurry, and moderator, Tamara Levitz. There, he presented material from the MLab’s Crocodile Cafe Exhibit. During his visit, he also met with several students conducting research in sound studies and ethnomusicology. The Kits and DFL in The Ring: The MLab’s Kits for Cultural History and the new Digital Fabrication Lab appeared in an article written by Tara Sharpe for The Ring, UVic’s community newspaper. The article, “Makerspaces Matter,” was published both online and in print. 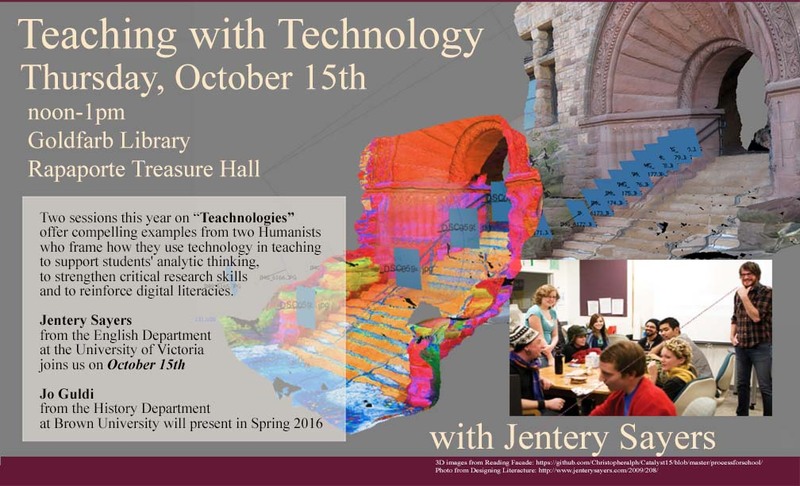 MLab at the BC Library Conference: Jentery had the opportunity to discuss the MLab’s humanities infrastructure at the 2015 BC Library Conference in Vancouver. He also fielded a variety of questions about the potential role of makerspaces in libraries. Sharing Our Inventory: The MLab decided to publish a record of our inventory for public access. In a collective effort, Kat, Danielle, Nina, Shaun, and Jentery organized and compiled an MLab infrastructure list into a pretty handy spreadsheet. MLab at DHSI 2015: The MLab team revised their syllabus for “Physical Computing and Fabrication in the Humanities” at the Digital Humanities Summer Institute. The week-long course was taught by Nina, Shaun, Devon, and Jentery, and it concluded with an exhibit of programmable media designed by the students. MLab at Union College: Union College in Schenectady, New York hosted the Engineering and Liberal Education Symposium, which focused on the intersection of engineering and the liberal arts. For the first session, “Exploring the Aesthetic and Humanistic Dimensions of Maker Culture,” Jentery presented a talk titled “Prototyping as Inquiry” to outline the relationship between the Kits for Cultural History and Fluxkits from the 1960s, ’70s, and ’80s. MLab Goes to School: At the Port Townsend School of Woodworking in Washington, Danielle and Jentery attended a workshop, “Beginning Digital Design and Fabrication.” During the course they learned about the digital fabrication techniques and software used in a three-way axis CNC router system. They also learned more about how woodworkers, engineers, and other practitioners are using fabrication techniques as part of their work. MLab in CTheory Books: For the CTheory publication, Conversations in Critical Making, Garnet Hertz interviewed Jentery about the MLab, prototyping, and humanities approaches to science and technology studies. The interview appeared in the book as a chapter titled, “Humanities and Critical Approaches to Technology.” Hertz also interviewed Phoebe Sengers, Natalie Jeremijenko, Matt Ratto, and Alexander Galloway. How Did They Make That? : Inspired by the work of Miriam Posner (Digital Humanities, UCLA), Tiffany published, “How Did They Make That? : For Undergraduate Projects.” It addressed an important gap in media studies and digital humanities research. MLab on CFUV: UVic’s radio station, CFUV, interviewed Nina about her media practice and work in the MLab. MLab Farewells and Hellos: This year the MLab said goodbye to assistant directors, Nina Belojevic and Shaun McPherson, both of whom were part of the team since the lab’s opening in 2012. With their departures, the MLab welcomed the addition of several new team members: Tiffany Chan, Liam Cline, Victoria Murawski, Nadia Timperio and me (Teddie Brock). Devon Elliott, Katherine Goertz and Danielle Morgan continued with the team from 2014-15. MLab on UVic Homepage and CBC Radio: The MLab’s Kits for Cultural History were featured on UVic’s homepage along with a short article and demonstration video produced by the MLab team. Later in the month, Jentery made a radio appearance on CBC’s All Points West to discuss the Early Wearables Kit with host, Robyn Burns. MLab Hosts Tanja Carstensen: Tanja Carstensen is a sociologist and post-doctoral researcher with the Work-Gender Technology research group at the Hamburg University of Technology. She visited UVic to present her talk, “Gender, Makerspaces, and Laboratory Culture.” In her lecture, she analysed how makerspaces and digital fabrication labs could potentially renegotiate power and gender relations in regards to technology. She also addressed some ongoing social problems facing makerspaces. MLab in SRC: In the journal, Scholarly Research and Communication (Issue 6.3, 2015), Jentery published “Why Fabricate?”, which outlines the MLab’s research on the relevance of fabrication techniques to humanities inquiry and cultural criticism. MLab and Vibrant Lives at ASU: At Arizona State University, Nina and Jentery participated in the interdisciplinary performance, Vibrant Lives, at the Herberger Institute for Design and the Arts with Jessica Rajko, Jacqueline Wernimont, Eileen Standley, and Stjepan Rajko, among others. The project critically engages with design and movement to explore “data shed” and the connections between bodies, technologies, and information. This trip was a highlight for the MLab team in 2015. It was also a wonderful opportunity for us to collaborate with our amazing colleagues at ASU. MLab at Brandeis and URI: Hosted by John Unsworth and Deb Sarlin, Jentery visited Brandeis University to deliver a talk about pedagogical practice in academic makerspaces. Immediately after this talk, he also gave a talk at the University of Rhode Island (URI) titled, “Teaching and Learning Across Makerspaces and Classrooms,” on invitation from Karim Boughida (Dean, URI Libraries). MLab at Rutgers: Danielle had the opportunity to present the Early Wearables Kit at Rutgers University-Camden during the “Kits, Plans, and Schematics” media arts exhibit, curated by Helen J. Burgess, James J. Brown, Jr., Robert A. Emmons, Jr., and David M. Rieder. Throughout the exhibit, participants were encouraged to interact with the artists’ and researchers’ projects. Danielle designed the MLab’s portion of the exhibit and also delivered a brief introduction to the Kit. MLab Presents “Prototyping the Past”: Tiffany, Danielle, Kat, Victoria, and Jentery discussed the Early Wearables Kit during a panel at the University of Victoria. Along with the Kit, the team discussed the MLab’s approaches to rapid prototyping and media history. MLab Goes to Middle School: Kat and Jentery conducted a hands-on workshop for students at Arbutus Middle School. 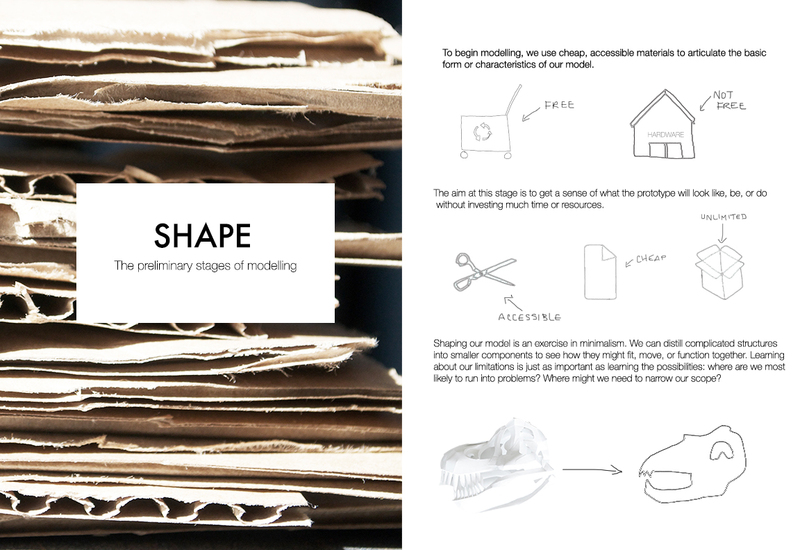 To illustrate objects as both bits and atoms, they had students use laser-cut parts to arrange and build 3D models of animals. They also borrowed material from Hannah Perner-Wilson’s Kit of No Parts to explain the concepts and practices of prototyping. MLab Launches Early Wearables Repo: The MLab released the Early Wearables Kit repository on Github for public access. The repo contains 3D models of the skull stick-pin, the mechanism, and the box built for the kits as well as historical illustrations, a guide, essays, assembly instructions, and metadata. MLab in Hyperrhiz: The new media and net art journal, Hyperrhiz: New Media Cultures, published the Early Wearables Kit in their “Kits, Plans, Schematics” issue, edited by Helen J. Burgess and David M. Rieder. The publication consisted of a critical essay (by Jentery), process posters, a video, a GitHub repository, and an about page. MLab at CUNY Graduate Center: On invitation from Patrik Svensson, Jentery attended the “Digging Deep: Ecosystems, Institutions and Processes for Critical Making” event at CUNY Graduate Center, where he contributed to a session with Anne Balsamo, Matt Ratto, Natalie Jeremijenko, Allison Burtch, Cathy Davidson, and Shannon Mattern. MLab at the Sorbonne: Jentery spoke with students at the University of Paris-Sorbonne about prototyping the past. Katy Masuga‘s students read and responsed to one of Jentery’s manuscripts. MLab Hosts Artist Lecture: The MLab sponsored a guest artist lecture by Jesse Colin Jackson (Electronic Art and Design at the University of California). His talk, “Pixels in the Material World: From Frank Lloyd Wright to Marching Cubes,” explored unit-based architectural models in digital visualization. Programming an Optophone: Tiffany started programming a reading optophone to translate text into audible tones for a new kit about Mary Jameson and the history of optical character recognition. This work involved a combination of a Raspberry Pi with Python and OpenCV. MLab in Visible Language: The design and visual communication journal, Visible Language, published Jentery’s article, “Prototyping The Past” (Volume 49, Issue 3), which draws on the MLab’s Early Wearables Kit to articulate a methodology and case study for combining media history with rapid prototyping techniques. MLab at INKE 2016: At the 2016 INKE conference in Whistler, BC, Jentery followed up on “Why Fabricate?” with a paper on how a care and repair paradigm could inform the practice and culture of digital studies. Later in the year, Matthew Huculak and Lisa Goddard followed Jentery’s paper with their article in dh + lib. Andrew Stauffer at the MLab: While visiting UVic to give an excellent talk on his “Book Traces” project, Andrew Stauffer (English, University of Virginia) dropped by the MLab and gave our magnetic recording kit a try. Remaking Parts a Scanner: Kat made significant progress with our 3D scanner, demonstrating how it could be combined with CNC techniques to remake parts of old phones, which were central to our research on early magnetic recording. Web Design Workshop: As part of our “Hello World” series with the Digital Humanities Summer Institute, we offered a free, public workshop on how to make simple websites with Markdown and Git. MLab and UVic Anthropology: Jentery presented the MLab’s Early Wearables Kit for UVic Anthropology’s Graduate Colloquium. He also had an opportunity to talk with UVic Anthropology students about their research, including research involving media history and material culture. MLab at IdeaFest: The MLab presented at UVic’s annual IdeaFest research festival during a panel titled, “A New Labcoat in the Humanities,” which showcased how the humanities engage in collaborative, hands-on research. MLab at Cornell: On invitation from the Society for the Humanities, Jentery visited Cornell University to give a public lecture on “Prototyping Absence, Remaking Old Media,” based on the MLab’s Kits for Cultural History project. He also had an opportunity to attend a meeting of 2015-16 Society Fellows with Timothy Murray and many others. MLab at Syracuse: Following his visit to Cornell, Jentery gave another MLab-based talk, this time at Syracuse (on invitation from Patrick Berry), for Writing, English, Digital Humanities, Composition and Culture, Libraries, and the Humanities Center there. The talk addressed the intersections of writing, prototyping, and pedagogy, drawing on student research at UVic. Here’s an abstract. While at Syracuse, Jentery also conducted a Scalar workshop and visited the amazing Belfer Audio Archive to listen to their collections and have a conversation with Jenny Doctor (Director of the Archive). Patrick Williams (Syracuse University Libraries) followed Jentery’s talk with “Reflecting on Networks,” which also discusses the work of Lori Emerson and Clay Spinuzzi, both of whom recently visited Syracuse, too. UVic Hosts Julie Flanders: With support from UVic’s Digital Humanities Committee, Julie Flanders (English and Digital Scholarship, Northeastern University) presented a series of Lansdowne lectures at UVic, including a talk titled, “Building Otherwise: Gender, Race, and Otherness in the Digital Humanities.” During her visit, Flanders visited the MLab, and we discussed our various projects with her. MLab + ETCL Host Daniela Rosner: With the Electronic Textual Cultures Lab at UVic, the MLab hosted Daniela Rosner (Human-Centred Design and Engineering, University of Washington), who gave an inspiring lecture on “Imaginative Interventions: Design as Inquiry.” Her talk walked us through a series of case studies in critical design and making as forms of social inquiry to generate new understandings of design products and practices. Rosner also visited both labs and spoke with researchers there. We were quite excited to have Rosner on campus; she’s inspired the MLab for some time now. Reading Optophone in the DRC: Tiffany, Victoria, and Jentery wrote “Remaking Optophones: An Exercise in Maintenance Studies” for the Digital Rhetoric Collaborative (DRC) at the University of Michigan. The Reading Optophone Kit is the MLab’s third volume in the Kits for Cultural History series. MLab in the A DH Companion: With Kari Kraus, Bethany Nowviskie, William J. Turkel, and Devon Elliott, Jentery published “Between Bits and Atoms: Physical Computing and Desktop Fabrication in the Humanities” as Chapter 1 in A New Blackwell Companion to Digital Humanities, edited by Susan Schreibman, Ray Siemens, and John Unsworth. Several arguments in that chapter correspond with the MLab’s approach to media history and theory, and they also speak to why work by Kraus, Nowviskie, Turkel, and Elliott has so deeply informed the MLab since its opening in 2012. MLab at Washington State: On invitation from the Center for Digital Scholarship and Curation, Jentery visited Washington State University to talk about “Remaking Old Media across the Disciplines” and also discuss the challenges of conducting archival research in Science and Technology Studies. While he was there, he conducted a workshop on low-tech prototyping, or prototyping without digital tools, with support from Kim Christen and Trevor Bond. MLab at the University of Hawai’i: At the University of Hawai’i, Mānoa, Jentery gave two Dai Ho Chun Distinguished Lectures on prototpying the past and media history, both of which drew from the MLab’s Kits for Cultural History. He also appeared on Hawai’i Public Radio, talking with the hosts of Bytemarks Café about the MLab’s research. The hosts, Burt Lum and Ryan Ozawa, were especially interested in the Lab’s Early Wearables project. While he was on the Hawai’i campus, Jentery visited with faculty, staff, and students in Digital Arts and Humanities, including David Goldberg (American Studies) and Rich Rath (History), who also supported his visit. MLab for The Lab Book: Darren Wershler interviewed Tiffany and Jentery for the Lab Book project, which Wershler is writing with Lori Emerson and Jussi Parikka. The interview is titled, “Prototyping the Past: The Maker Lab in the Humanities at the University of Victoria,” and it discusses the MLab’s research, projects, and infrastructure. MLab at HASTAC 2016: Tiffany and Jentery both presented during HASTAC 2016 at Arizona State University (ASU). For her talk, Tiffany discussed the MLab’s research on the optophone, emphasizing how the process of prototyping reveals historical absences and also points to ignored labour practices. For the panel, “Critical Design and Deviant Critique,” with Kim Knight (U. of Texas at Dallas), Padmini Ray Murray (Srishti School of Art, Design and Technology), and Jacqueline Wernimont (ASU), Jentery discussed the relationship between design, labour, and knowledge production in prototyping projects. MLab at the University of Washington: Kat and Danielle attended the Undergraduate Research Symposium at the University of Washington (UW) to give a talk on the Kits for Cultural History. The title of their talk was “Technology off the Page,” and they presented on a panel with students from Informatics, Near Eastern Studies, Geology, Human Centered Design and Engineering, Linguistics, Theater, and Art History. Prototyping in an English Graduate Seminar: For English 508: “Prototyping Texts” at UVic, Tiffany demonstrated how prototyping happens in the classroom and applies to historical and cultural research in English. She created a portfolio, titled “Act Natural: Prototyping Autodidactism, Forging the Self.” It performs various critiques of Dale Carnegie and involves experiments with type, print, HTML, and bots. Later in 2016, Annette Vee (English, Pittsburgh) mentioned Tiffany’s persuasive prototyping work in the MLA’s Digital Pedagogy project. 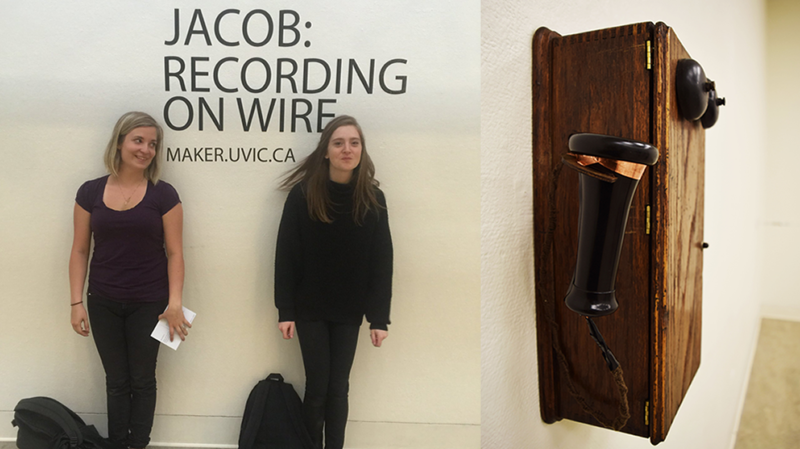 MLab in UVic’s Audain Gallery: With contributions from Jentery, Tiffany, and me (Teddie), Danielle and Kat installed “Jacob: Recording on Wire” in UVic’s Audain Gallery. The exhibition involved three public demonstrations of early magnetic recording, drawing materials from the MLab’s second volume in the Kits for Cultural History series. It was received with great enthusiasm from many attendees who had the opportunity to impress their own voices onto piano wire suspended across the gallery. The Martlet also covered the exhibition, interviewing Danielle and Jentery about it. Sounding Out the Optophone: As a result of her programming and electronics research on the history of optical character recognition, Tiffany produced a video demonstrating how reading optophones scanned type. This process is very difficult to discern when studying archival materials alone. Tiffany’s video renders it much easier to understand. MLab at DH 2016 in Poland: For the annual Digital Humanities conference, Tiffany gave a talk on “Designing for Difficulty” (slides) in Kraków, Poland. It discussed how the MLab prototypes historical absences by combining CNC and 3D modelling techniques with labour studies and media theory. 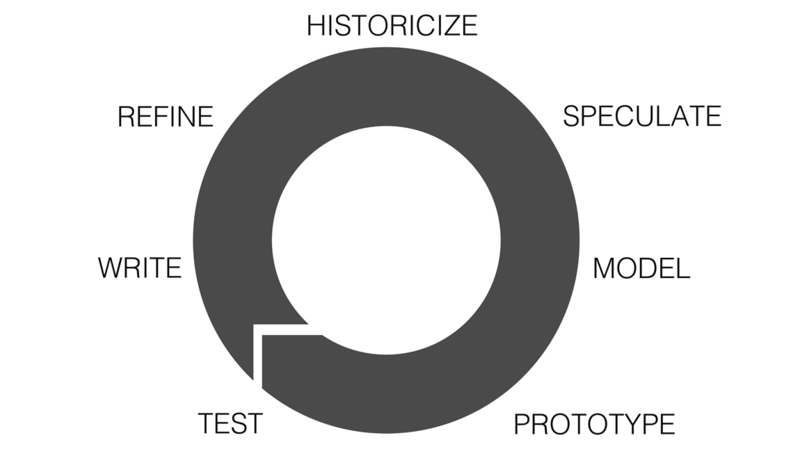 This talk was the MLab’s first long paper on prototyping at the annual DH conference. MLab Compiles Early Magnetic Recording Repo: The MLab compiled and later released version 1.1 of the Early Magnetic Recording Kit (the second volume in the Kits for Cultural History series) as a public repository on GitHub, with contributions from Kat, Danielle, Jentery, Tiffany, Victoria, and me (Teddie). MLab Releases the Optophone Repo: The MLab released version 1.1 of the Optophone Kit (the third volume in the Kits for Cultural History series) as a public repository on GitHub, with contributions from Tiffany, Kat, Danielle, Victoria, and Jentery. Scanner in the Library: With support from UVic Special Collections (especially Matt Huculak), Tiffany experimented with 3D scanning various books, manuscripts, and other materials, including cuneiform from 2150BCE. She later wrote a report on her findings as part of a directed study in UVic English. MLab in Doing Digital Humanities: Nicole and Jentery published a chapter, “Fabrication and Research-Creation in the Arts and Humanities,” in Doing Digital Humanities, edited by Constance Crompton, Richard J. Lane, and Ray Siemens. 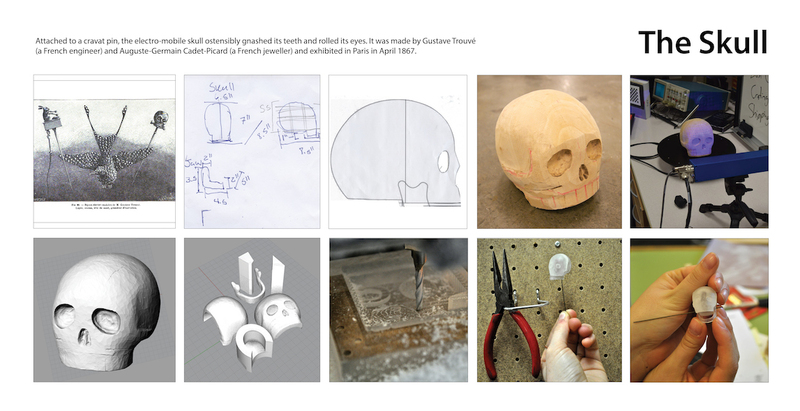 In the chapter, Nicole and Jentery underscore the creative and experimental uses of CNC machines, which are usually treated as technologies for replicating objects or models that already exist in the world. Let the Illustrated Guide Begin: Danielle, Jentery, and Tiffany began working on the MLab’s Illustrated Guide to Prototyping the Past, the Lab’s collaborative project for 2016-17. The Lab is aiming to release the Guide in print by September 2017, with contributions from Danielle, Jentery, Tiffany, Kat, Maasa, Evan, and me (Teddie). More from us very soon! Post by Teddie Brock, attached to the Makerspace project, with the news, physcomp, fabrication, and exhibits tags. Featured image of Katherine Goertz and the “Jacob: Recording on Wire” exhibit care of Danielle Morgan.